Iowa City, IA – A new campaign is reminding farmers about the dangers of skin cancer and heat stress, and how to stay protected. Iowa’s Center for Agricultural Safety and Health and the Great Plains Center for Agricultural Health have created a poster and radio clips for the campaign. The poster states that farmers and other outside workers receive 2-3 times as much ultraviolet radiation from the sun as indoor workers. 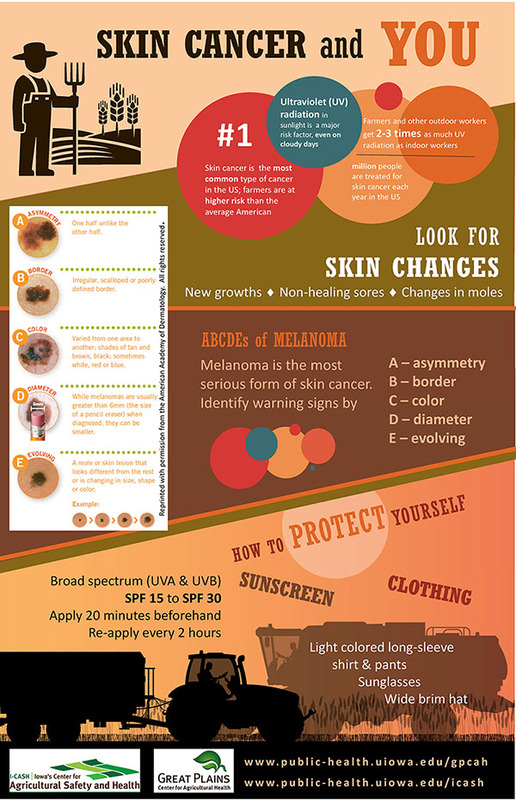 Using images, the poster also illustrates the warning signs of melanoma (the most severe type of skin cancer): asymmetry, border, color, diameter and evolving. Put on broad-spectrum sunscreen (which protects against UVA and UVB rays and is SPF 15 to 30) 20 minutes before work, and reapply it every two hours. Wear a wide-brim hat; sunglasses; pants; and a long-sleeved, light-colored shirt. Drink water before getting thirsty. Wear light, breathable fabric such as cotton.